The other day, I was having One of Those Days. Do you ever have them? I sat at my worktable, staring before me, not really sure what to tackle. And so, listlessly, without really thinking about what I was doing, I reached for my Stitch Fun lattice work sampler. I picked up a pencil and a ruler. And I started drawing lines all over the thing. It’s ok to mark out lines for lattice work, as long as you’re very sure you can cover those lines. I really wasn’t thinking about that. And I wasn’t working according to any plan. And when I finally caught myself and realized I might be going a little overboard with the lines, this is where I was. And my mood perked right up! I pulled out a needle and thread, and I started covering up the lines. Embroidery is just the best Mood Perker-Upper! The last time we played around with lattice stitches, we looked at battlement couching, a lovely lattice work filling stitch that creates a gradation of color and is just doggone fun. This time, I probably should have picked up the sampler with the intention of working out one more lattice tutorial that I have on The List, but I was feeling a bit flippant and carefree, so I just stitched whatever popped into the Old Noggin. And that’s really what’s fun about lattice work – it’s easy to get a varied look, just by switching out colors, changing the angle of the lines, changing the way they are couched, changing any kind of filling in between them. It’s so much fun. 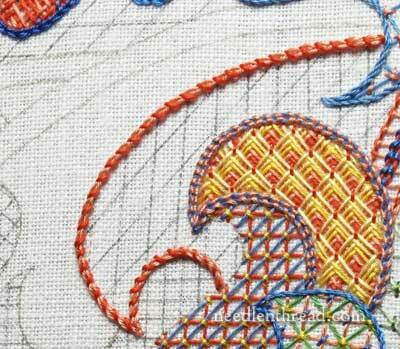 You hardly even have to stop and think when you’re stitching randomly like this! Besides filling in latticed areas, I outlined a few shapes previous worked. 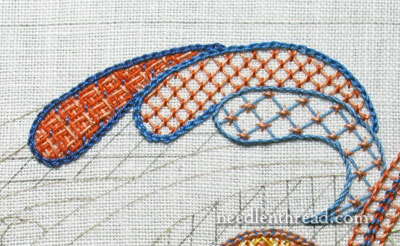 The lattice filling in the red outlined shape is discussed here, and the filling in the blue outlined shape is a variation of Griffin Stitch, which started the whole Lattice Fiasco. 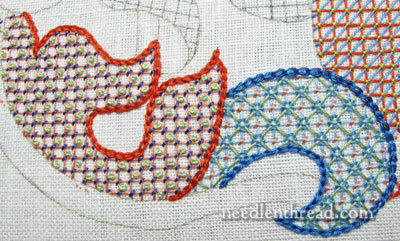 Some of the unfilled shapes received outlines – this empty shape in the background is worked in whipped chain stitch, which creates a nice ropey line. And then I started filling in the background of the right side of the sampler. It’s just a simple diamond lattice in light green, with the intersections couched vertically in dark green. If I wanted that background to be darker, I could go in and work some kind of filling inside the diamonds – anything from a simple straight stitch or cross stitch to a French knot. Each step I took that day was completely random. And I needed some Randomness! It was fun and relaxing, and it warmed me up for some more “serious” embroidery. But really, if you want your embroidery to remain pleasurable, I have this notion that you can’t really take it – any of it! – too seriously. If your embroidery becomes a serious, weighty endeavor, it can lose much of its appeal. That’s why I love playing around with stitches, just for the fun of it. It reminds me that embroidery is supposed to be delightful. Ah, me. I think I’m in love. Do you ever do anything different, to lighten up your approach to embroidery? If you find your projects becoming too weighty or overwhelming, how do you counteract that? Do you ever indulge in random stitchery, or are you a purely-planned-project stitcher? What’s your take on random, off-the-top-of-your-head embroidery? I’d love to hear about it – feel free to have your say below! 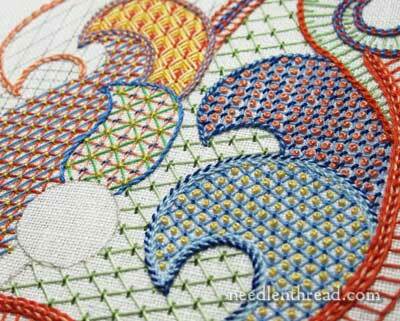 This lattice work sampler is part of the Stitch Fun Series here on Needle ‘n Thread. You’ll find all the articles in this series, plus the line drawing for this strange sampler, located in the Stitch Fun Index, if you want to check them out! You cheer my rainy day! As an example of randomness, your sample is turning out a masterpiece! Only a pro could do something like that! Unfortunately, I have to stick to thought-out projects which, if complicated can, as you say,become weighty, and (may I?) boring! But I´m also in love, so to overcome this I have several projects on the go simultaneously and jump around until they all get finished (even a year or more later 🙂 ). Love ALL your posts. Keep well. You asked for Stitch Fun! I’ve had more fun making up new stitches and patterns for biscornu! They are tiny pincushions that take a quizical shape simply because of how they are stitched together. But without any stitch fun, they’d be quite boring! So I add a new twist here and an old twist there….and before I know it, I’ve created some pretty neat little guys to give as gifts to anyone who has a pin or needle in their house. People love these as gifts and I love giving them! Can I send you some pictures? Hi, Karen! Oh, do send photos – would love to see them! Hi Karen – Well I have been seeing the word biscornu here and there in the comments, but after reading your comment – I looked up the word and tried to get a real hands on tutorial – I just can’t get the process. Is there a tutorial that you know of that is very straight forward? I hope Mary posts your pics – I would love to see them also!! Thank you for inspiring me – I love little cute things – and these really are cute “little guys”!! Thanks – blessings to you. Today is a gloomy day, rain, rain, our snow is melting and we have one day off from boiling maple sap. I love opening your courriel early morning and I truly enjoy the Play Stitch. It is so much fun to see what you do… all the colors etc. I try your stitches all the time, many times, it works other times, humm you know… practice to make it good. Thank you for putting a little sunshine in my day. I have been stitching a “crinoline lady” and she has become ..weighty …as you said. I’ve decided to take your advice and free up my attitude towards her and change some of the stitching to less demanding designs. I love embroidery and it is very unusual for me not to want to pick up the project I have on the go . Your article and advice was very timely……THANK YOU. Because I have trouble delegating, I have a motto, which is “Share the Fun with Everyone”. Your Stitch Fun Series, and all your wonderful newsletters exemplify my motto to a T.
Hi Mary, Love your randomness and stitching creativity. I’m always learning from you and enjoy what readers post. Embroidery IS such a creative pleasure. Not enough hours in a day to stitch! Thanks for your wonderful articles and site. After I finish a project, I take time off for a little while to study my other patterns–my ‘stash’ to figure out if I can put new stitches in the piece, read my embroidery books for inspiration, and play with my threads for color combinations. I have a quick question: I am starting a huge project soon–30″x24″. It’s a vintage transfer from 1979, basket with lots of different flowers. I found the most beautiful linen to sew on (after much researching) from ‘Traditional Stitches’ in Calgary. The owner was most helpful with fabric advice, but my question is: for a piece so huge (will be matted and framed for a wall), should I be stitching with a lightweight interfacing behind it as I go along hand stitching? Some of my stitching friends nearly cried with pain when I mentioned this. They said it would be crazy, very difficult to stitch through linen and interface, and I’d never get the project finished. Also, advice about needle choice/suggestions for a project this size? Appreciate your thoughts. Haven’t seen a posting about this. Thanks for any advice or suggestions. Roxanne from Mpls. Thanks for this showing us all the different types of Lattice stitches how beautiful. Your Noggin certainly created a beautiful design with the different stitch colours and designs you are so creative. Thanks for all the tutorials in the stitch fun series they are so helpful and inspiring it makes me want to pick up some fabric and use my noggin to stitch, although it wouldn’t be as creative as yours, but I live to be inspired by your daily creativity in embroidery. I tend to work on a similar process – where I have an idea in my head but it progresses almost with a life of its own – I combine stitching and art quilting and the pieces grow as a new idea comes. I do have a question though – our needlework guild has a “learn a stitch” portion of the meeting and we usually chose a project that will be completed at the end of the year. Several of us have been following your project with this lattice work and I would like to know if we could use this as a guild project? Also – what size are you actually working – the drawing we can download seems much smaller in scale that the piece you are working on. I would really appreciate an answer as I think this would be something really new and quite different from what we have worked on so far. If there would be a fee – what would it be? or would you require everyone to down load their own set of notes? Hi Mary, Since you showed this sampler, I saved it, it is so colorful and pretty, love the sttiches you used. Now I will save this lovely addition to my collection. Thank you for inspiring us to keep on stitching. Hi Mary – I am in such a different place than you when it comes to embroidery – but I learn so much from you – gleaning what applies to my personality. do have an impact on me – in one way or another. (I dont do more than 2 pieces at a time, otherwise I fear I wont get any of them completed). Superb! simply superb. I love it Marry. stitches and I am learning so much. I really love the design. Stitching should always be fun. And reading your thoughts is always fun. And even fun-ner when I misread “whipped chain stitch” as “whipped cream stitch”. LOL Thanks for the inadvertent laugh. You are my sunshine in this rainy day. OMG, I love it, it’s beautiful! Ok, I’ll be waiting then. As I’m from Brazil I’ll need plenty time to organize my trip. I’m crazy about your work and would love to learn a little from you. As I can see you’ve inspired so many people! Thank you for your time with your thoughtful reply, today, Mary. I just learned something new again about interfacing, muslin backing (didn’t think about that fabric) and needle advice. Much appreciative as always to you. I have been following the Jacobean Jumble for some time now and have read through some of the earlier posts; but I do not seem to find what fabric you used. What would you recommend putting the pattern on to? BUT necessity is the mother of invention and I have fun trying alternatives. So there is another learning curve. I enjoy Randomness in my stitching, and have two or three projects on the go at a time. Normally a cross stitch (a little structured), and then two others, currently crazy quilting and then an embroidery piece. This gives me the opportunity to make my ‘recess’ time different too. You don’t always want to eat peanut butter sandwiches! Thanks once again for all the interesting information and the laughs. 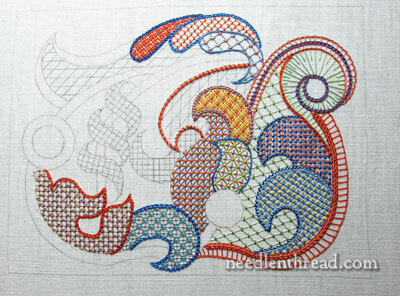 This reminds me of “Zentangles” using linen and thread instead of pen and paper. One of the benefits of that type of drawing is the zen-like state your mind goes to. 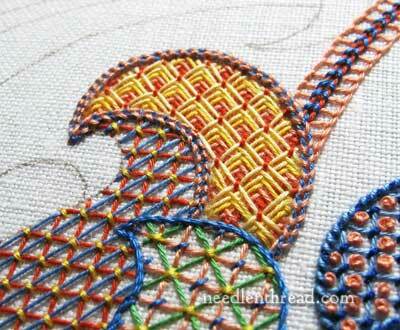 So maybe that is why this type of stitching is happy stitching! 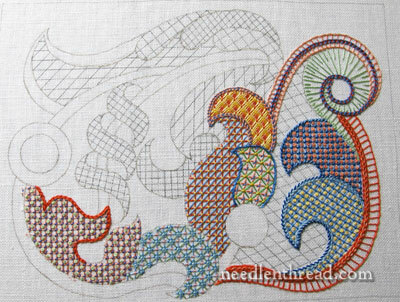 I never had so much embroidery fun as when I did a crazy quilt inspired Brazilian pattern. It was a pattern, but the colors got switched out, and i went “crazy” and did some of my own “block” motifs . The “seam” stitches weren’t dictated at all, so I really went to town. It was one of the most fun stitching experiences ever. Now my guild is working on a crazy quilt pumpkin and I feel excited all over again. I love the idea that you can do whatever you want and since it is “crazy” it will all fit together. Thanks Mary for the information on the fabric used. I’m a really slow stitcher, and often have a big piece in the works. But I need a break, too, so I always have a smaller, traveling piece. Currently, I also have a lovely little piece portraying the Madonna and Child stitched on 40 count silk gauze. I call it my morning project because I’ll only work on it when I’m wide awake and in extraordinarily good light. I have really enjoyed watching the development of the Lattice Sampler. As somebody else commented, it takes a real pro to be able to just go for this randomly. Of course, it’s what we’ve all come to expect (and appreciate) from you, Mary. I hate working on Spring Splendor. When I am tired of it, I take out a simpler piece and stitch for a bit. Makes me feel much better and ready to tackle Spring again. Absolutely have fallen in love with this project. I’m about to redo my bedroom Bohemian style right down to making an ‘almost crazy quilt’ (some blocks will be crazy and some won’t, just like life! This will be my first ‘project’ for the room and I’m planning on turning it into a pillow. Now to go buy every color thread I can find and get started! Thank you so much for your amazing site and your willingness to ‘teach’ us all online! ~Stitchin’ Deep in the heart of Texas!